October 31 to November 6, 2011 was print week in New York City. I did what any respectable, adventure-seeking printmaker would do. I hopped on a Greyhound bus and headed to the Big Apple. 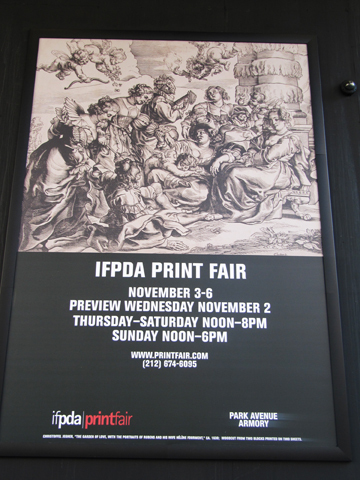 My first cultural visit was the International Fine Print Dealers Association (IFPDA) Print Fair. 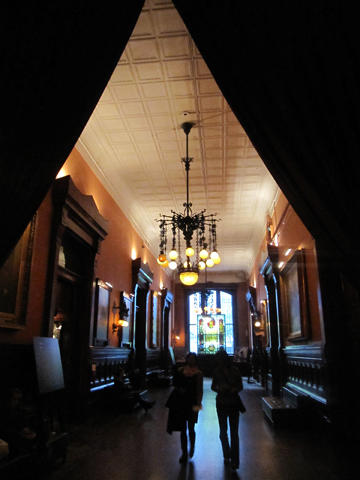 The event was housed in the elegant Park Avenue Armory, known for its magnificent 19th-century interiors, including a veteran’s room and a library designed by Louis C. Tiffany. Armed with my press pass, I entered the main exhibition hall and experienced two hours of bliss. The fair featured over 90 international art dealers from Europe and North America, all members of IFPDA. Notable dealers participating this year included Pace Prints, Marborough Graphics, Two Palms, David Tunick, Inc., The Paragon Press, Hill-Stone Inc., Gemini G.E.L. and Barbara Krakow Gallery. 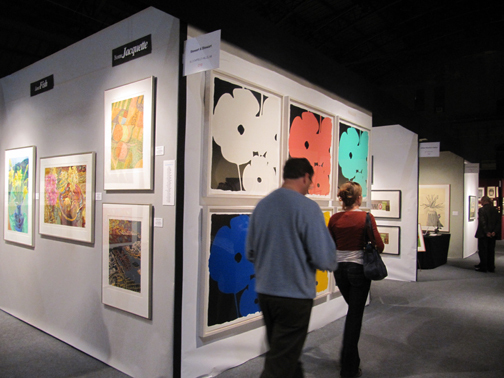 The IFPDA Print Fair is the largest international art fair dedicated to exhibiting fine prints from all periods. There was a good balance of historical and contemporary work. I saw masterpieces by Albrecht Dürer, Rembrant van Rijn, Fransisco de Goya, Juan Miro, Pablo Picasso, Jasper Johns and Richard Prince, to name a few. Prices ranged from a few hundred to a few million dollars. There was a smattering of red dots beside prints, mostly in the foreign exhibitors’ kiosks. The fair was teaming with sixty and seventy-something collectors making the rounds. I spotted mostly women and some couples. The women were smartly dressed in classical casual designer wear, usually black, offset with gold necklaces or colorful silk scarves, pacing the aisles in patent leather pumps, clutching their big purses with big bucks. 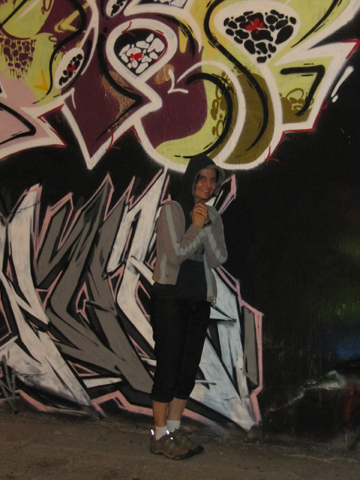 Besides eavesdropping, I looked at the art. The interesting thing about viewing art in such a generous setting that overflows with images, is that certain pieces manage to jump out. 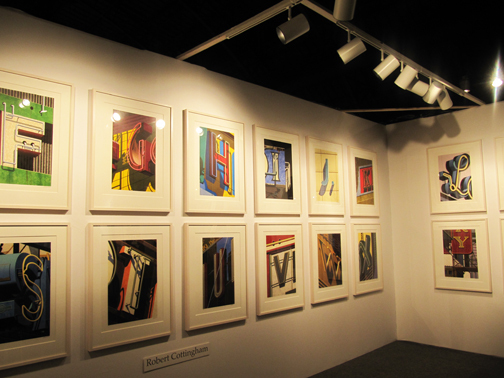 As one enters the exhibition hall, Tandem Press welcomes visitors with An American Alphabet, a striking set of lithographs by American artist, Robert Cottingam. These alphabet prints are based on photos taken by the artist while traveling across the United States. While not highly original, these images emit the nostalgic aura of bygone Americana. My favorite piece was a mixografía print on handmade paper by John Baldessari, a contemporary American artist. 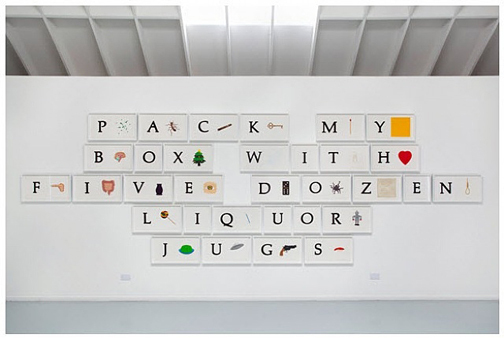 A B C Art (Low Relief) Part II: PMBWFDLJ (Pangram). A pangram is a sentence that uses all the letters of the alphabet. The visual impact, whimsical message and impeccable execution caught my eye. I enjoyed the work of Sophie Calle, a French writer, photographer, installation and conceptual artist. 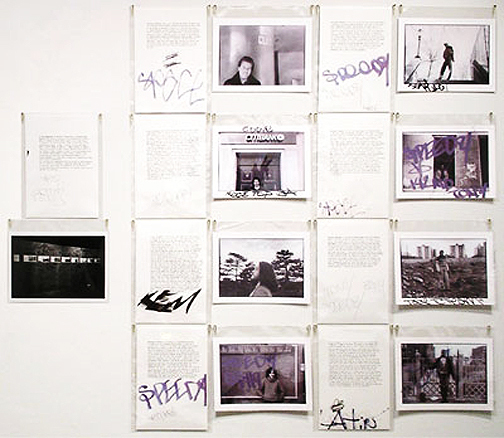 The Bronx is a set of 9 Iris prints with accompanied texts. Calle went to the Bronx and asked strangers to take her to their favorite place in neighborhood and to describe the significance of these locations to her. The stories are moving, well written, and with the photos create a revealing portrait of the Bronx. The cultural anthropologist and writer in me thrived on this piece. The gallery owner thanked me for reading each of the stories. 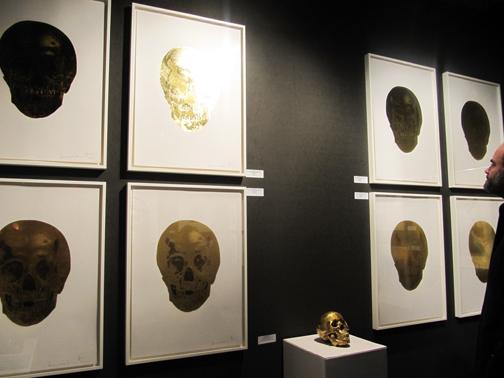 Damien Hirst, an English artist, showed Death or Glory, a series of two-color gold foil block prints of his trademark skull imagery. Foil blocking is a commercial process where a metal block is heated on a press and a metallic or colored foil is branded onto the material. The titles, such as Death or Glory Hazy Gold include the actual names of the gold pigments used to create the dazzling iridescent effects. 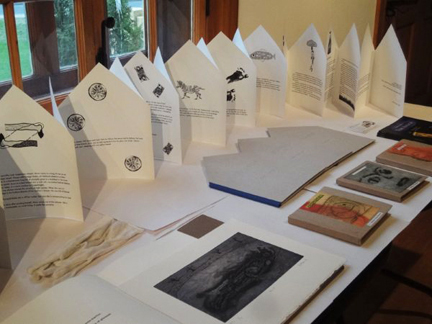 As with mixografia and foil block printing, the fair showed several examples of work executed in non-traditional printmaking techniques: luminescent prints, laserjet prints mounted on plexi, and stereoscopic prints. I also noticed an abundance of highly embossed prints, sometimes bordering on gaudy. 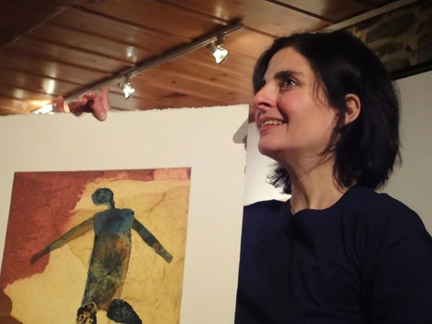 The IFPDA Print Fair is a fascinating destination. Not only does it attract high profile collectors, museum directors, celebrities and noted philanthropists, It draws its fare share of artists. As I left the exhibition hall I saw a sign: NO ART WORK LARGER THAN 3X4 FEET MAY BE CARRIED OUT THE DOOR. My empty hands hinted that I belong in the last and best category of visitors. From September 22 to October 22, 2011, Han Art presents Manuel Lau’s Época & Era, the artist’s latest series of oil paintings. Época & Era grasps your soul, absorbs your dreams, stirs your questions, mirrors your heart. 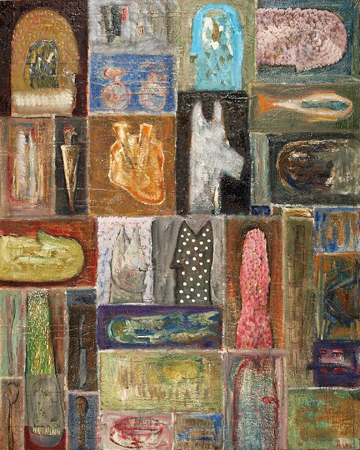 It juxtaposes pieces of life, gleaned from the collective unconscious, spiced with the artist’s personal impressions. The paintings in Época are like game boards, with no start or finish, waiting for players to remix human and animal heads, with fish, gloves, bowls, umbrellas and knives, creating multiple scenarios with open endings. These elements interact quietly on the canvas, creating a brew of potent emotion. Like hieroglyphic characters, these symbols spell out messages, albeit subliminal, subject to interpretation.The repetition of certain forms such as the primitive human profile, becomes a mantra, creating a sense of harmony. In the Era series aquatic creatures float amongst vegetables and organic forms captured at different stages of gestation. Again, these paintings suggest possibilities of how life may develop. 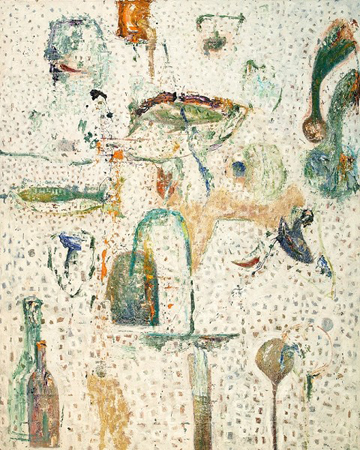 In Era V fish, bottles and heads are depicted on a textured surface, reminiscent of parchment. Like continents on an ancient map, these elements entice us to explore and discover. In Era XI a red chair, surrounded by radiant color, beckons us. It could be one of those paint-speckled chairs that one finds in artists’ studios. Perhaps it personifies the artist himself, reflecting on his paintings, deciphering their cryptic messages. The chair invites us into Lau’s world and entices us to bask in its warmth. Época & Era is an opportunity to step into the imagination of a constantly evolving artist. Manuel Lau comes from a successful graphic arts background. 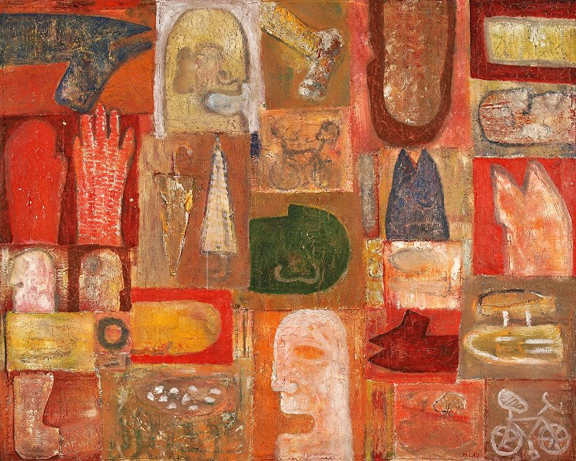 This exhibition, entirely dedicated to painting, marks his commitment to painting. It offers the promise of an era of treasures to come. 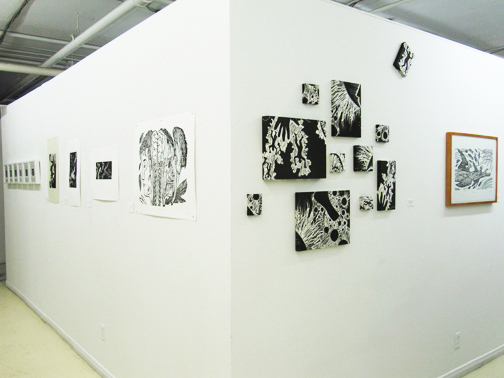 I am presenting thirteen linocut prints in ICARE 6, a group exhibition at l’Usine C, in Montreal. This show features René Donais, Talleen Hacikyan, Michel Lancelot, Noémie Lesquins, Roland Pelletier and Deborah Wood. 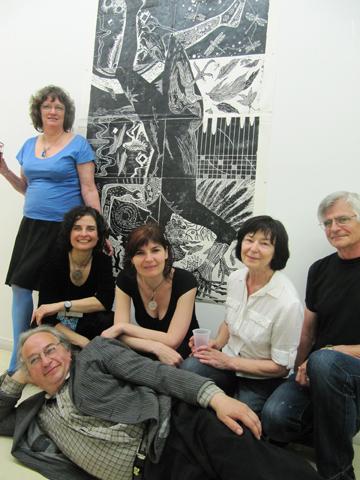 The stellar piece of the show is La chute d’Icare, a collective linocut, measuring close to seven by four feet. Each artist also presents prints inspired by the myth of the fall of Icarus. After working on the large collective linocut, I wanted to make miniature prints. The small square format inspired letters. In this series, Icarus spells out his name with his body while narrating his story. This choreography of letters, like a graffiti writer’s tag, affirms identity and perpetuity. I created the Icaro series specifically for the ICARE 6 exhibition at l’Usine C. The Italian and Spanish name Icaro has an operatic ring to it that I found suitable for l’Usine C. I was also attracted to the graphic possibilities of the letter O, that inspired a lifesaver for Icarus. Other letters are formed with trees, the moon and the sea. These elements act as props on a stage for lyrical, dream-like scenes that contrast with the tone of the myth of Icarus. I fell in love with printmaking in Monique Carbonneau’s relief printing class at Université du Québec à Montréal. 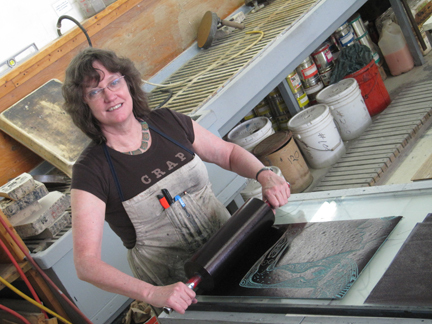 When I graduated in 1985, I joined Atelier Circulaire, where I continued making woodcut prints for two years before exploring other print techniques and focusing on collagraphy. The ICARE 6 project let me reconnect with relief printing, my first passion. ICARE 6 continues at l’Usine C until October 15, 2011. Exhilarating, refreshing, welcoming. These are the words that I associate with the Under Pressure International Graffiti Convention, which took place on August 13 and 14, in Montreal. 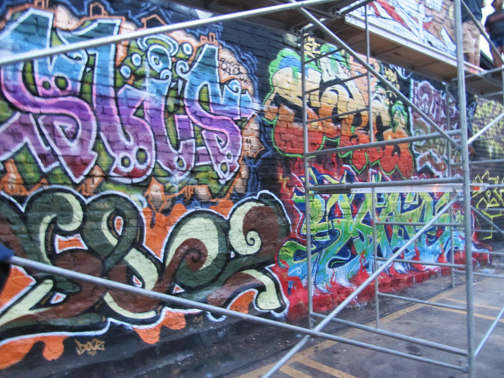 Hats off to Sterling Downy, the founder of this festival for creating this stimulating and safe venue for graffiti writers. 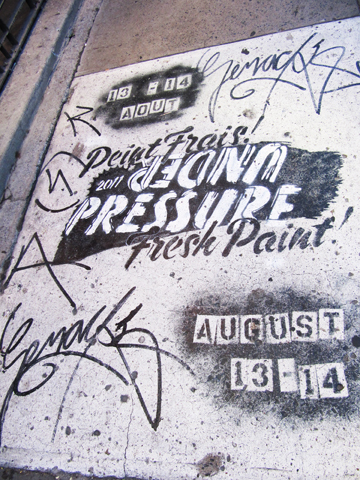 I headed to the 16th edition of Under Pressure on Sunday evening. After a draining afternoon of dragging my consumer-weary feet over the black arrows that direct customers through a money-trapped maze, otherwise known as Ikea, I felt rejuvenated as I explored the back alleys of Les Foufounes Éléctriques on Saint-Catherine Street. The hiss of spray cans, the explosion of color on brick walls, the elegant and daring skateboarders, the captivating break-dancers and the uplifting backbeat provided by emcees and DJs jolted me out of shopper’s stupor. Since I caught the tail end of this event I could admire many finished pieces by graffiti artists from Montreal, Berlin, Paris and London. Axel Void’s work caught my eye for it’s sparse treatment and it’s dark emotional charge. Mostly, however, I was charmed to witness this block party where young people could practice their passions in peace. 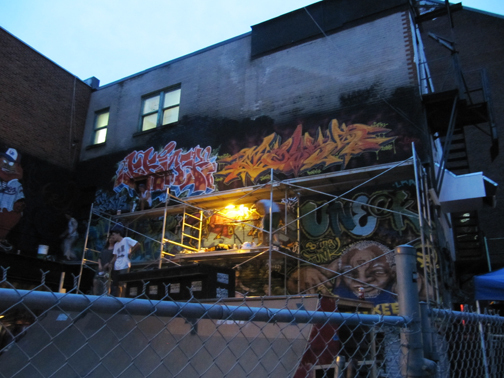 Some writers were applying finishing touches to their murals on their designated wall, delineated by scaffolding boards and frames. This quintessential contemporary urban scene somehow reminded me of prehistoric cave artists. I visited the new two-story Pop-UP gallery across the street, housed in a historic building that once belonged to the French daily La Patrie. It features large open spaces in a state of semi-decay, which echos the interiors of abandoned buildings infiltrated by street art. The art at Pop-Up did not jump off the walls and ceilings. Most of it felt lifeless and confined without the interaction with urban elements and the buzz of street life. 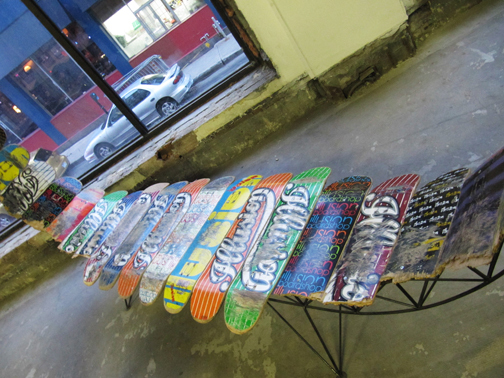 I was, however, pleased to discover the work of Janie Belcourt, who designs furniture from reclaimed skateboards. Her pieces work well in this setting, oscillating between chic and street smart. My last stop was Les Foufounes Éléctriques, to check out the mural that is repainted with each new edition of Under Pressure. I was impressed by the medley of expressions peering from the black and white portraits created by the collective En Masse. It is a perfect backdrop for the nightlife that flows in and out of the club. No matter where one sits on the controversial graffiti fence, one cannot deny the existence of this vital form of expression. To see it celebrated in the context of the Under Pressure festival is eye-opening and reassuring. 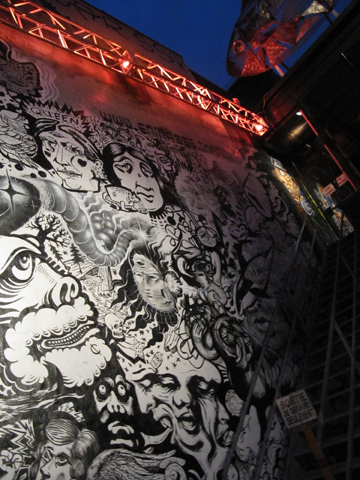 Self-run and funded through donations and fundraisers, UP consistently delivers a unique event that embellishes the city and demonstrates that graffiti is an art in its own right, that can be practiced in a harmonious setting. The sun is in full force in Montreal and Icarus has stars in his eyes. 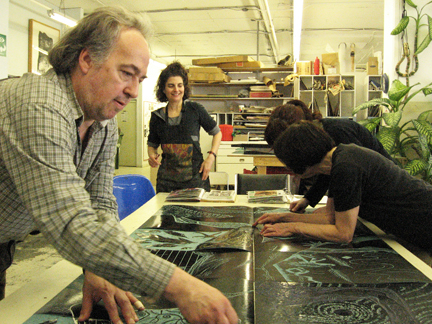 From August 16 to October 15, 2011, Icare 6 will be exhibited at l’Usine C. This show, featuring linocut prints by René Donais, Talleen Hacikyan, Michel Lancelot, Noémie Lesquins Rolande Pelletier and Deborah Wood, will inaugurate the new cultural season. Autour d’Icare, the original edition of this exhibit, was first presented at Atelier Circulaire in June 2011. The six artists will present an exciting, expanded version of this show with new works created specifically for l’Usine C.
L’Usine C, founded in 1995 by Carbone 14, is a centre for the creation and diffusion of multidisciplinary contemporary arts. 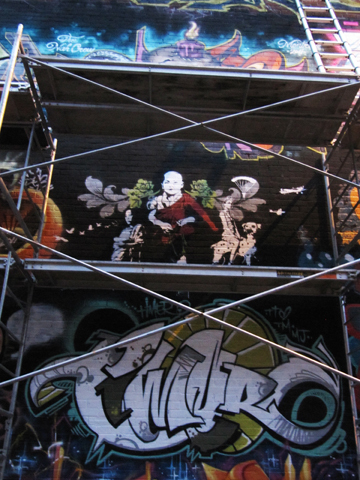 It is located in the heart of Montreal’s Centre-South neighborhood, in what used to be the old Raymond factory. The architecture features many of the original elements such as cement columns and ceilings while skillfully integrating them with new materials such as glass, steel, metal and wood. The building itself is worth a visit. 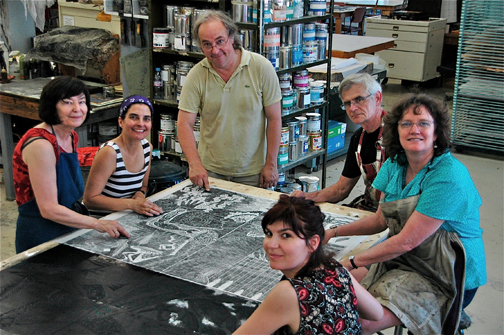 A couple of weeks ago, during the height of the heat wave, the artists met at Atelier Circulaire to make a new print of our large collective linocut. 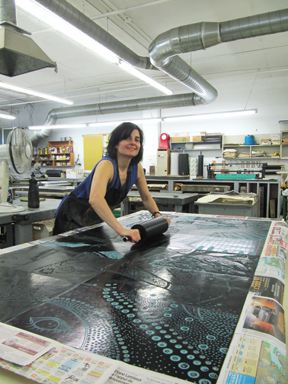 This enormous plate, originally intended to be printed by steamroller, is a challenge to print by hand. My fellow artists used tablespoons to transfer the ink onto the paper, while I used a metal soap, that works like a dream, without breaking your fingers in the process. We printed onto Kuzuke, a thin Japanese paper that we glued onto Arches. Come September 6, we will celebrate the fruit of our efforts at a vernissage in this unique theatre centre, the atmosphere of which has been compared to venues in Soho and Berlin. Hope to see you there, Montreal that is. Vernissage : Tuesday, September 6, 2011, 5:30-8:30 p.m.
Michel Lancelot, et en avant, René Donais. 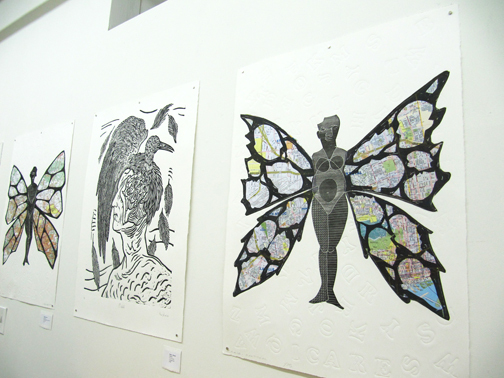 Autour d’Icare is an exhibit of twenty-eight linocut prints by six artists on the theme of Icarus. 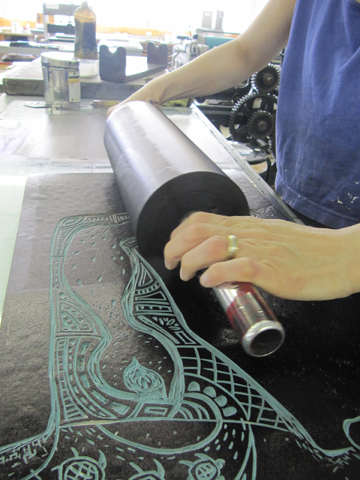 All the work has been printed in black, creating a classic look that enhances the graphic quality of linocut printing. 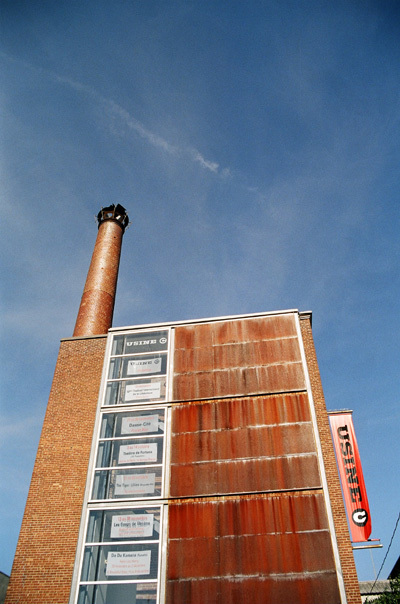 The pièce de résistance is La Chute d’Icare, a large format collaborative work by Angelikno, René Donais, Talleen Hacikyan, Michel Lancelot, Rolande Pelletier and Deborah Wood. The creative process that led to La chute d’Icare is unique. Once the artists decided on portraying a life-size Icarus, Talleen struck the pose of the Greek mythological character falling through the sky. 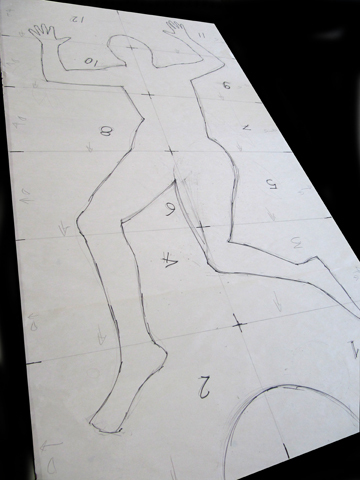 The other artists traced her silhouette onto paper, perfected the sketch freehand and transferred it onto the linoleum plate. This plate was cut into twelve equal pieces. Each artist was assigned two plates randomly, to engrave on their own. 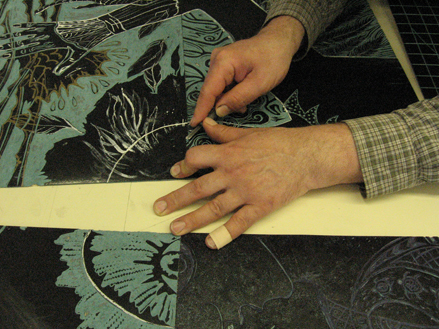 Once the plates were assembled, the artists completed their pieces according to the whole work. The resulting print is exhibited next to the engraved linoleum plate, where one can appreciate intricate lines and textures. 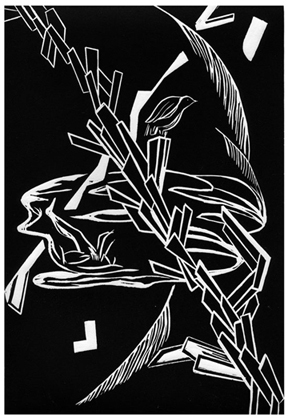 The linocut printing technique was first used by the artists of Die Brücke in Germany between 1905 and 1913, where it had been used for wallpaper printing. Picasso and Matisse made many linocuts and helped establish the technique as a professional print medium. Each artist in this show exhibits a series of prints. 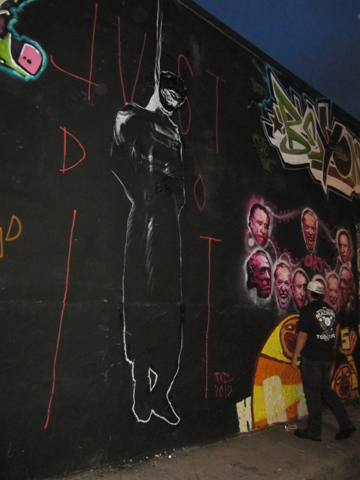 Individual identities are given free reign here and these works echo the artists’ contributions to La chute d’Icare. Six artists offer six visions of the Greek myth about Icarus’s failed attempt to escape from Crete by means of wings crafted by his father Daedalus. Rolande Pelletier plays with a purified style that marries abstract and figurative expression. In Chute d’Icare I, the perched bird, is a reference to Bruegel’s painting on the same theme. René Donais’s Le bras d’Icare, where birds try to escape from the flesh of the forearm, confirms the artist’s fascination for anatomy. 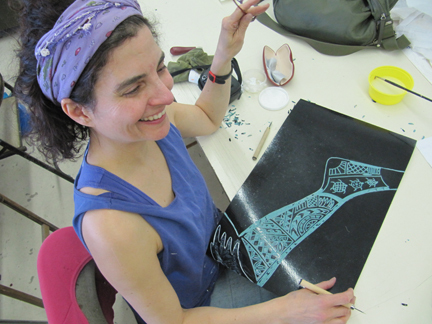 Better known as an intaglio artist, René created his first linocuts for this project. 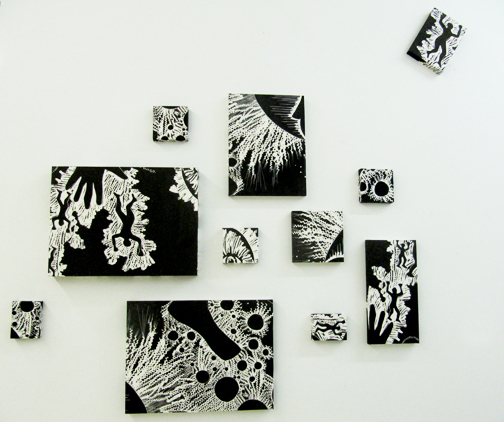 Angelikno presents an installation of linocuts on wood panels. She selected sections from her plates in La chute d’Icare. The decomposition and rearranging of imagery create a visual code for new interpretations of the theme. Talleen Hacikyan presents a series of six mini prints, executed in the tradition of hand-drawn typography. Icarus’s body spells out the story of his fate while spelling out his name, as if to affirm his existence or to preserve his identity. Michel Lancelot in Icarus Paris and Icarus Montreal, introduces touches of color to the show with maps of the respective cities, forming Icarus’s wings. The maps transpose the mythical character, suggesting the universal and timeless relevance of his story. 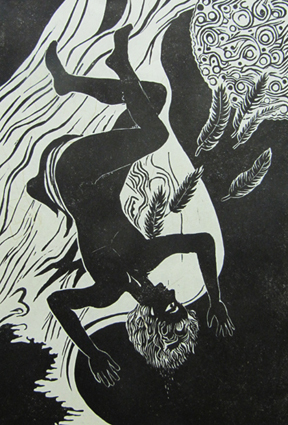 In Deborah Wood’s Chute d’Icare, Icarus is portrayed during his fatal fall. 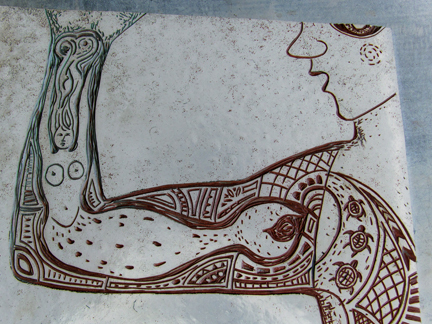 The juxtaposition of the figure with the background also suggests birth or perhaps rebirth. Autour d’Icare is a rare opportunity to see a show devoted to the linocut and to witness a remarkable artistic collaboration. 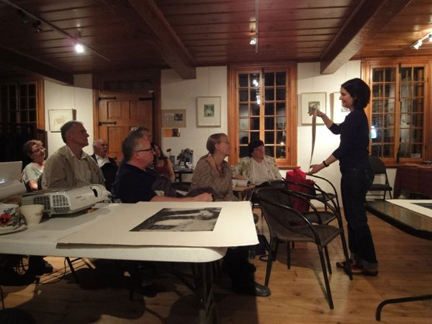 On May 6, I gave an artist’s talk at La Maison Valois in Vaudreuil-Dorion. I enjoyed spending some quality time in this charming historical building. 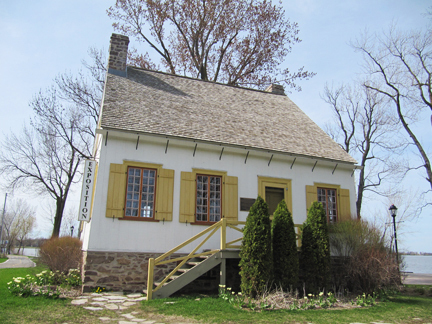 Built in 1796, in fur trading territory, the house was bought by the city of Dorion in 1970. Today La Maison Valois is a cultural centre. 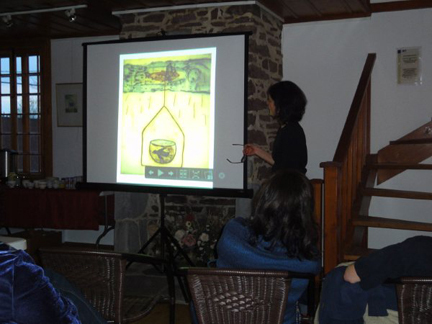 My presentation was part of l’Oeil Ravi’s series of artist’s lectures, organized by Annouchka Gravel Galouchko and Stéphan Daigle. It was an occasion to present my work to a new audience from the region, composed of artists and the general public. I started the first half of my presentation by showing some original woodcut prints, created in 1985, when I joined Atelier Circulaire. I followed this with a projection of prints from the past nine years. When I paused the projection midway for a question period, I was pleased to interact with this inquisitive and expressive crowd. There were many technical questions, from artists and non-artists. I continued the projection with step by step photos of me printing at my studio and finished with images my current dress series. 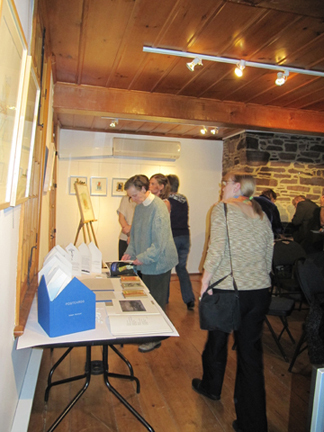 The coffee break was a perfect opportunity for everyone to view the exhibit of my prints and to peruse the table of artist’s books and the display of prints next to their plates. There was a warm feeling in the Maison Valois. People approached me and expressed genuine gratitude. 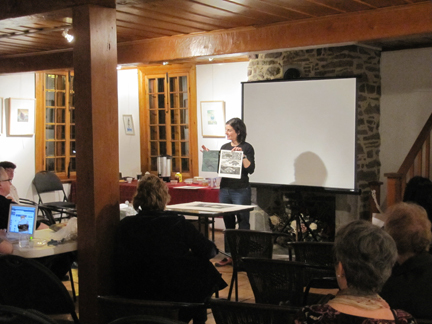 For the second part of my talk I filled in the missing links between my first woodcuts and the projected work. I showed original prints that represent important periods of my work, commenting on influences, how one stage influenced the next and recurring themes. The audience, alive as ever, asked questions and made perceptive comments that kept me on my toes and giving them more until 10:00 p.m. It is always interesting to present my work. Each experience reminds me of the undeniable fact that printmaking solicits technical curiosity. 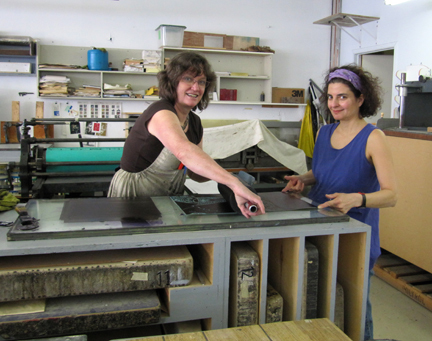 People want to know how– how long, what paper, what glue, what wood, what tools, what press. My mother, who was in the audience, remarked the next day, that to hear some of the questions, you’d think that the inquirers were at work in front of a press! 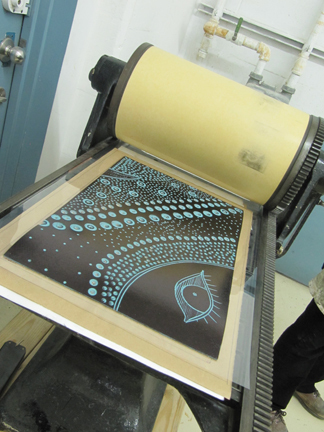 Two days left before the Steamroller Printing Event. The weather forecast for Saturday calls for 100% chance of precipitation, and temperatures ranging from 2 to 11 degrees celsius. Not exactly the sunny skies that greeted Icarus on the day of his first and final flight. 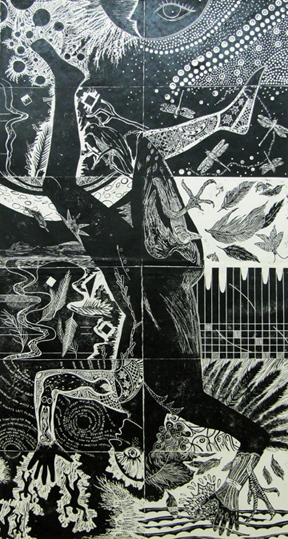 In preparation for this printing event, a group of five artists and myself have been carving a collective linoleum plate, inspired by The Fall of Icarus (see previous 3 blogs). 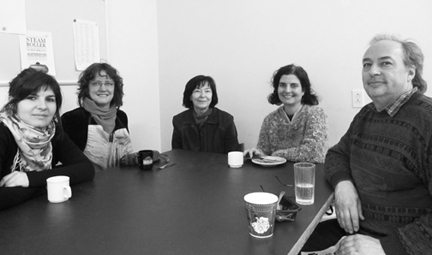 The past couple of weeks have been full of exciting work sessions with my fellow artists. 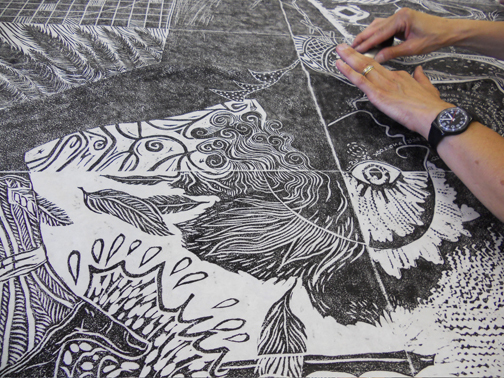 Each artist engraved two linoleum plates, sections of our main design. The day we put our pieces together was thrilling. The ensemble of our work took on a life of its own, a very intricate, expressive and unique life. Put into the context of the whole piece, we were better equipped to take decisions regarding our individual plates. We worked on transitions between sections, and fed off each other’s work. There were several other sessions of collaborative work: printing proofs of all our plates, assembling our proofs and making further adjustments on our plates, gluing our linoleum to a 4 by 7 foot piece of plywood, and making a hand printed copy of our piece on Japanese paper. 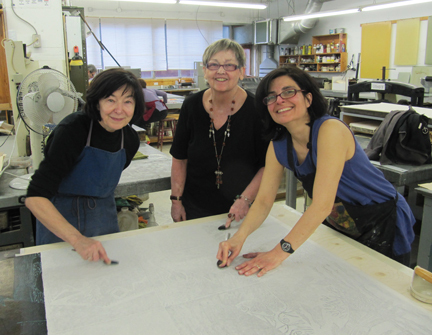 I had planned on hand printing a copy by myself and was happy to get lending hands not only from Rolande, but from Hélène and Mary, who are not working on this project. They couldn’t resist the allure of printing with a spoon, which with the size of our plate, is a real workout! I am humbled by the implication and enthusiasm of the artists I have the pleasure of working with. Although I have been sharing a studio with these artists for years, working on this project has allowed me to witness firsthand their creative process. I gained insight into how they perceive and make visual decisions. It may rain on Saturday but this continues to be a bright experience for me. As we arrange final details such as packing and transporting Icarus to his destination, I have the distinct feeling I am preparing for a trip. I will pack Icarus’s suitcase, like I used to pack my son’s when he was a baby: inking roller, masking tape, scissors, latex gloves, rags and talcum powder to wipe off ink stains. Thank God I don’t need to haul diapers! Although with the weather forecast being what it is, I may take some Tylenol in case Icarus catches a cold. Traditionally Fridays have always been animated at Atelier Circulaire. 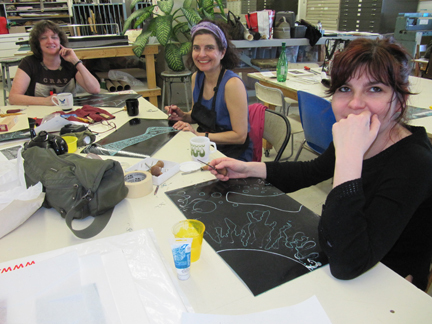 The studio comes alive as artists work, socialize and congregate around presses and the kitchen table. The phone rings off the hook and visitors flow in and out the door. The atmosphere is nothing short of electric. Last Friday was no exception. 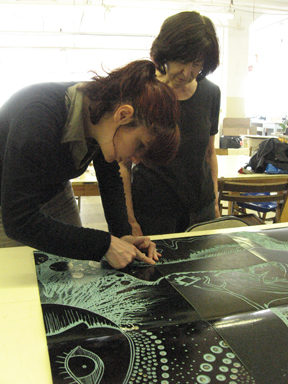 Deborah, Michel, Noémie and I worked on our Icarus print, a collaborative project involving six artists. Michel and I made test proofs of our linoleum plates. Deborah adjusted the pressure of her 1910 Potter Proof Press, designed to proof handset type for corrections before the final printing of a newspaper. 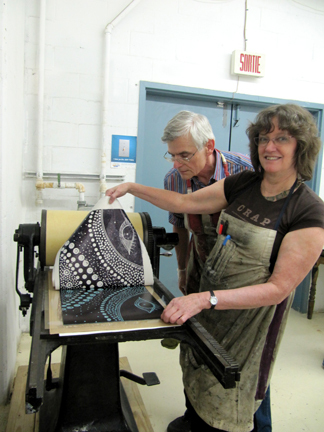 It was a treat to have Deborah ink my plate and print it on this handsome machine. I was relieved to discover that I’ll be able to work with the bubbly texture that resulted from leaving my plate in the oven too long (see previous blog, Icarus Flew In My Oven). Michel carved a plate with a section of the sun, and another with a fragment of thigh and buttock. True to his experimental nature, for the sun he created a radiating array dots with a drill, playing with different bits. On his other plate Michel juxtaposed the body with a linear geometric treatment. Our printing was followed by a carving session. I worked with Deborah, sharing her sophisticated tools, which she gets sharpened professionally at l’Aiguiserie on Papineau. At ease with her tools, carving fluidly, Deborah lets her imagination flow freely. I witnessed the fine balance between preplanned composition and improvised textural development on her plate. After Deborah and I treated ourselves to a delectable Chinese lunch at Luck Hop Foo on St. Laurent, we got back to work at our table, where Noémie joined us. She has the second half of Michel’s sun and used the electric drill to continue Michel’s dots on her plate. 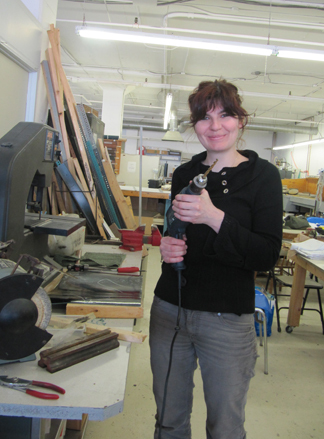 Noémie didn’t need a power tool for speed. When she switched to hand tools, her image progressed rapidly, revealing her uniquely graphic style. As Deborah, Noémie and I carved our plates side by side, it felt like we were participating in a quilting bee. Our easy, jovial chit-chat was punctuated by spells of concentrated silence, as each of us embellished pieces of what will become one image. It is a privilege working with the other artists in my group. I threw myself into this project without much premeditated thought. I was drawn to the idea of having a big piece printed under a steamroller, in front of a live audience. I didn’t realize that the process of getting to that point would be so rich and rewarding. A writer, on commenting about working autobiography into fiction, told me, “Once the personal experience blends into a story, it becomes something else.” I am reminded of this phenomenon as I work on this project. The figure on our plates is no longer me; it is Icarus, imprisoned in the palace of Crete with his father Daedalus; Icarus flying giddy with his new-found freedom, thanks to the wings of feathers and wax, crafted by Daedalus; it is Icarus, forgetting his father’s warning not to fly too close to the sun; it is Icarus plunging fatally to the sea. Perhaps because I have a teenage son, Icarus feels real. I can relate to his desire for independence, his forgetfulness while pursuing his thrilling adventure, and his vulnerability. I am working on one plate that has a section of an arm, and another with part of a leg. I opted for a playful approach to my subject. I tattooed Icarus, with motifs, that have a marine feel to them. I imagine Icarus and his father imprisoned in a palace tower with a little window with a view of the sea. 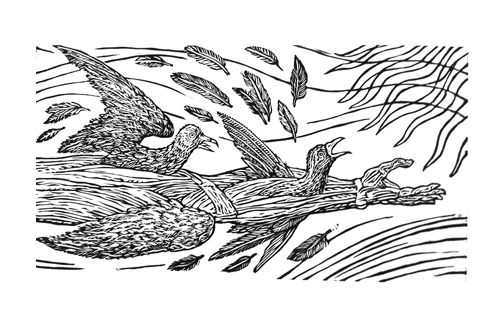 Seabirds would fly to the window ledge and Daedalus would pluck and collect feathers, some of which would be fashioned into wings, some of which would be used as quills to tattoo his son! It has been an emotional ride working on Icarus’s arm, ranging from euphoria, to utter frustration. Everything was running smoothly. The pleasure of the flight took over me. I was heating my linoleum plate for a minute at a time in my oven to soften it and make it easier to engrave. I popped Icarus into the 200 degree oven for one last time. I was ecstatic–I had carved a mesmerizing mermaid on his arm. I got distracted, let him overheat, dashed to the kitchen in a fury, flung open the oven door, only to discover that my background had bubbled. I plunged into oblivion. 40 requêtes. 0, 271 secondes.